As soon as you click the download button in order to acquire the Softtunes Search and Toolbar, you will be introduced to a setup offering you to install Trovi search tools. If you accept the offer, as soon as the toolbar is installed you will discover search.conduit.com set as the Home Page and Softtunes Customized Web Search as the default home page. Even though it is indicated that these search tools are enhanced by Google, we do not recommend trusting them. As it has been discovered, you may be presented with sponsored search results routing you to other search engines, online shopping sites, or other unreliable sources. As you may have noticed yourself, search.conduit.com is also represented via the toolbar which also provides links to amazon.com, facebook.com, twitter.com and smileyswelove.com. The toolbar also promotes Bejeweled, Calendar+ and PriceGong applications. 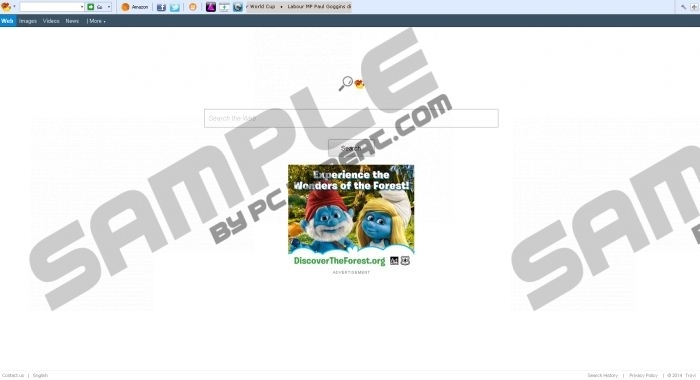 Other Conduit toolbars, including Freshy Toolbar, Bitlord Toolbar and Connect Toolbar, have been discovered to promote Conduit search tools and third party services as well. They could also offer you to install third party software, and this is something we do not recommend. You should have no hesitations about getting Softtunes Search and Toolbar deleted from the browsers. The suspicious conduit search tools can provide you with unreliable search results and display suspicious online advertisements. The toolbar is not greatly beneficial either. Therefore, all you have to decide upon right now is how you want to remove Softtunes Search and Toolbar. You can follow the manual removal guides presented below or you can install automatic malware detection and removal software to get rid of the undesirable software for you. Note that if you choose the latter option, and this is what we recommend, you will still need to delete the undesirable search tools manually. Access the Metro UI start screen, right-click and select All apps. Find the program you want to delete from the PC, right-click it and select Uninstall. Launch Google Chrome, simultaneously tap Alt+F and select Settings. Under On Startup mark Open a specific page or set of pages. Click Set pages and overwrite/remove the provided URL. Click OK.
Click Change and overwrite/remove the provided URL. Click OK.
Go to Search, click Manage search engines and choose/add a new default search engine. Click X on the URL representing the undesirable search provider and click OK. Launch Mozilla Firefox, simultaneously tap Alt+T and select Options. Click the General tab and locate the Home Page box below. Overwrite/remove the URL of the undesirable search engine and click OK.
Move to the search box on the top-right corner and click the search provider icon. From the appeared menu select Manage Search Engines. Click the undesirable search provider, click Remove and then OK. Launch Internet Explorer, simultaneously tap Alt+T and select Internet Options. Overwrite/remove the displayed URL and click OK.
Move to Search Providers and choose/add a new default search engine. Quick & tested solution for Softtunes Search and Toolbar removal.